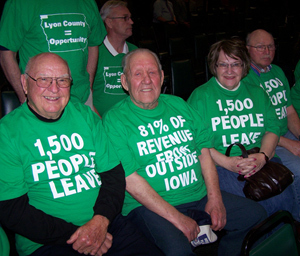 Supporters of a new casino in Lyon County wore green t-shirts with slogans on them at Tuesday’s meeting of the Racing and Gaming Commission. Sharon Haselhoff spoke for Kehl Management, which put together the plan for a $120-million casino project, which she says will be modeled after the Riverside Casino and Golf Resort that the company also owns. Haselhoff says their plan makes the most sense because it will draw 81% of its revenue from out-of-state customers, most notably Sioux Falls, South Dakota. She says Sioux Falls is only six miles away, Interstate 29 is only 17 miles away and Interstate 90 is only nine miles from their site. Haselhoff says I-90 is highly traveled by people going to the Sturgis motorcycle rally and to the Mt. Rushmore and Yellowstone national parks. Haselhoff says they can bring in the travelers and from neighboring Sioux Falls. Hazzelhoff says the Sioux Falls market has 224-thousand adults over the age of 21 within a 50 miles radius, and “that’s why the Lyon County Resort and Casino makes sense.” Jeff Gallagher is the president of the Lyon County Riverboat Casino Foundation, the nonprofit group that will hold the gambling license and distribute money from the casino. Gallagher says Lyon County is a primarily rural county based on agriculture and he says nearly 1,500 people leave the county every day to go to a job elsewhere. He says that is three times the average of the rest of the state, and they look forward to having 700 new jobs where people can work and stay in the county. The foundation will have some two-point-seven million dollars to distribute. Gallagher says they decided to give 50% in the form of grants to the cities in the county for projects. He says they will give 25% of the money to the three districts in the county, so each will get around $200,000. Gallagher says one schoolboard member told them that money would be nearly 10% of what they take in overall now in taxes. Gallager says the remaining 25% of the money will go to the cities and counties to use for their ongoing needs. The project will also include a hotel, three restaurants, an events center and a lake that will be used to heat and cool the casino. The casino would bring in an estimated $70-million in gambling money in its first year. Ottumwa casino supporter Richard Bamm. Developers of the casino plan for Ottumwa told state regulators Tuesday, that the casino will cause a ripple effect that will impact the community and on into southern Iowa. Ken Mimmack is the C.E.O. of Ingenus management which hopes to build the casino in Ottumwa on the Des Moines River. 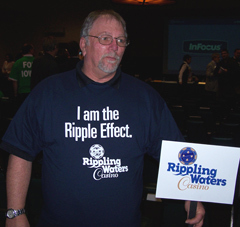 Mimmack says they call it the “Rippling Waters Casino” because of the ripple impact it will have. He says they will annually bring in $79-million to the state, with $71-million going directly to southeast Iowa. Mimmack says they will create 367 jobs, and that doesn’t include the 600 jobs created during the 12 to 16 month construction period. Mimmack addressed concerns that a new casino would pull customers away from the current Osceola casino. He says they have a plan to make sure that doesn’t happen by working with the other casino to market the region. Mimmack says they will market in their primary market, but says they have a “teardrop approach” that will reach down 114 miles into Missouri. He says they will be the closest facility to almost the center of Missouri and they believe there’s room for significant growth there that they can market together. Mimmack says the facility that will include a hotel with an indoor water park, along with two restaurants. The Racing and Gaming Commission will hold a pubic hearing on May 3rd, and then make a final decision on new licenses on May 13th.